To prevent weight gain or to continue losing weight, you may feel compelled to engage in unhealthy eating behaviors including severely restricting the amount of food that you eat and exercising obsessively, even when you are at a dangerous or unhealthily low weight. 20-30 million Americans live with eating disorders. Anorexia is most commonly seen in women and girls, but also occurs in men and boys. Anorexia is a dangerous condition, but it is treatable. Inpatient or hospital intervention may be required in serious cases. With help and treatment, you can learn to manage your symptoms and minimize its impact on your life. Take our online self-assessment to learn more about disordered eating and find help for yourself or a loved one now. It’s important to note that some individuals may experience many of the symptoms of anorexia such as severe food restriction, preoccupation with weight, and obsession with tracking food and exercise but they may not be at a low body weight. This is often referred to as Atypical Anorexia and is still extremely dangerous. People with eating disorders in higher weight bodies often take longer to get connected to treatment because family and health professionals do not see the visible warning signs of an eating disorder. See the OSFED listing for more on atypical anorexia and other types of eating disorders. Anorexia can be treated and managed through a combination of nutrition protocols, individual and/or family therapy, support and sometimes medication to address co-occurring mood disorders. If anorexia has severely impacted your physical or cognitive functioning, or you and your doctor decide that it would be beneficial, inpatient treatment may be the best option to safely guide you through parts of your recovery. Medical Intervention: Anorexia can lead to serious, even fatal, physical complications. The stress that starvation puts on your body may mean that you require inpatient treatment in a medical setting to regain lost organ function and begin healing your body. Inpatient treatment may also be the best choice for you if you need additional support to begin your journey to recovery. 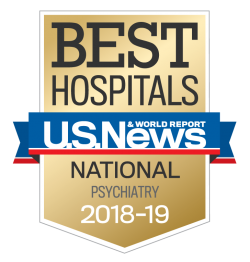 Learn more about inpatient treatment at Sheppard Pratt. Medication: Anti-depressants, anti-anxiety drugs and other medications are sometimes used in conjunction with regular therapy to treat symptoms related to anorexia. Your doctor can help you find the right combination of medications for you. Therapy: Specific types of evidence-based therapy can help you overcome anorexia including individual therapy, group therapy, family therapy, art therapy, and others. At The Center for Eating Disorders at Sheppard Pratt, we offer a variety of therapies and we can help you design the right therapeutic program for you. Education: Learning more about your triggers and educating yourself, your family and your friends about disordered eating and anorexia is an important step in your recovery. Read more about mental health in our Psych-lopedia.